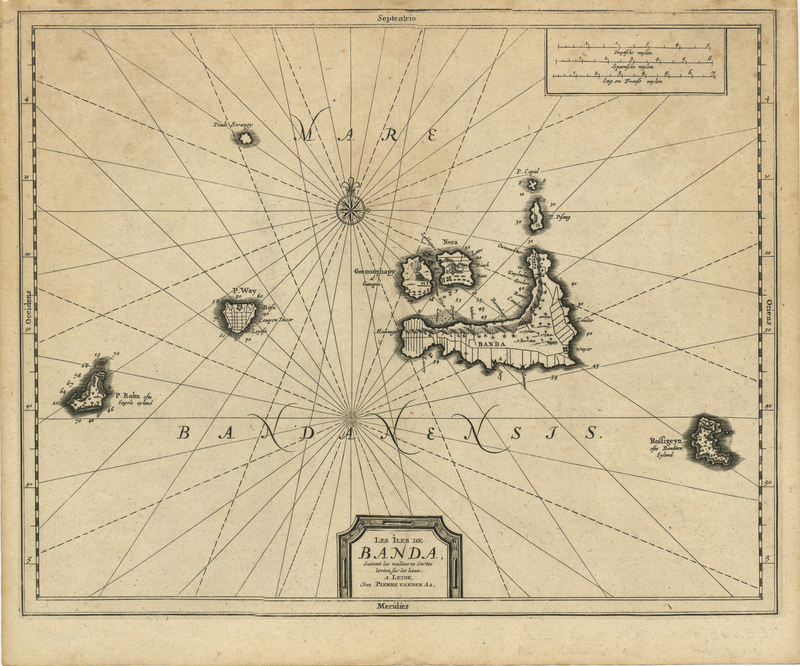 Antique Map Banda Islands titled ‘Les Iles de Banda, Suivant les Meilleures Cartes Levees sur les Lieux’ by Pieter van der Aa. Dutch chart of the Banda Islands Maluku, comprising the important Spice Islands. Until the mid-19th century the Banda Islands were the world’s only source of the spices nutmeg and mace, produced from the nutmeg tree. The map shows the plantations, Dutch forts and an erupting volcano. Pieter van der Aa (1659 – 1733) was a Dutch publisher working in Leiden during the early eighteenth century. He is best known for publishing maps and atlases, though he also printed pirated editions of foreign bestsellers and illustrated volumes.